Our Doctor Spotlight series continues today with a profile of Dr. Wendy Chang. We’re delighted to have an opportunity to introduce her to you more thoroughly. 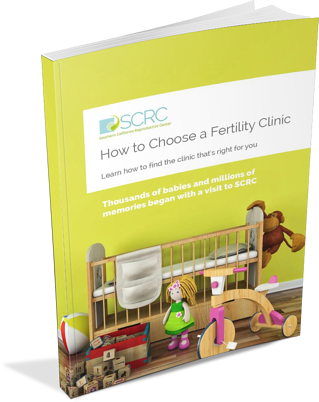 Trying to pick the perfect fertility specialist isn’t easy: there are so many questions to ask, and so many variables to consider. When you’re trying to make a short list of doctors to meet in person, there’s only so much information you can glean from a brief online bio. Our hope is that by learning a bit more about who Dr. Chang is, her achievements and goals, and most of all, how her patients talk about her, you’ll be better equipped to decide whether she might be the right doctor for you. 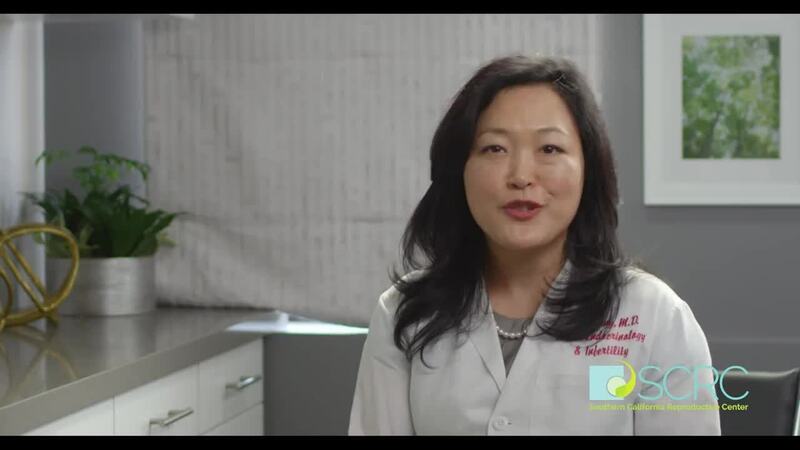 A Southern California Reproductive Center partner, and our scientific director, Dr. Wendy Chang is a board-certified reproductive endocrinologist and obstetrician/gynecologist. Her career has been devoted to learning, education and the care of her patients, supported by her extensive research and exceptional clinical expertise. Dr. Chang’s medical education began at UCLA, where she received her bachelor’s degree in biology from UCLA. She earned her medical degree from the University of California, Davis, and went on to complete her residency in obstetrics and gynecology at Harvard Medical School and affiliated training programs at the Brigham and Women’s Hospital, Massachusetts General Hospital, and Children’s Hospital, Boston. Next came a three-year clinical fellowship in reproductive endocrinology and infertility at the UCLA Geffen School of Medicine. Recognized by her peers as a leader in her field, Dr. Chang is the recipient of many awards and honors, including the Outstanding Resident Surgeon Award from the American Society of Laparoscopic Surgeons, SART Membership Committee, UCLA Health System Board, Westside Guild for Children’s Hospital, and National Charity League. She was named a Southern California “Super Doctor” by her fellow physicians since 2010. We talk about the empowering effect of information a lot on this blog. There are so many myths and misconceptions about infertility and fertility treatment out there, and so many people who need to hear that there is help out there for them. That’s why outreach and education are such an important part of what we do, and we’re fortunate to have a team of experts who are more than willing to share their expertise. Dr. Chang is a brilliant teacher and an invaluable part of SCRC’s outreach work. She’s a regular speaker and presenter at our seminars, and whether she’s talking young women through fertility preservation at our egg freezing events or helping families understand which treatments might help them achieve their dream of a new baby at our Fertility 101 Seminars, her expertise is a wonderful resource for prospective patients. Dr. Chang has also been a valuable panel member and speaker at events in the wider community, such as Wine, Women, and Wisdom and Women about Town. When she’s not sharing her knowledge in-person, Dr. Chang can often be found contributing to stories about fertility in the media. She has been interviewed on television many times and quoted in dozens of press publications, including Self, Women’s Health, Forbes, ABC News, Prevention, Bustle and more. Dr. Chan’s devotion to education extends to her peers and the next generation of fertility specialists: she has presented her original research at meetings of the American Society for Reproductive Medicine, Endocrine Society, and Pacific Coast Reproductive Society, and she serves as assistant clinical professor of obstetrics, gynecology and reproductive medicine at the UCLA David Geffen School of Medicine and the USC Keck School of Medicine. She has published many articles in peer-reviewed journals and publications such as Fertility and Sterility, Human Fertility, and Sexuality, Reproduction and Menopause. Dr. Chang has also been a contributing author in several influential books about infertility, menstrual disturbance, and PCOS. We’re extremely proud of Dr. Chang’s academic and scientific accomplishments, of her passion for education and outreach, and of her constant pursuit of excellence. But nothing compares to hearing directly from the patients whose lives have been changed forever with her help. We are honored whenever a patient decides to share their experiences with SCRC and our doctors. Dr. Chang’s warmth, compassion, skill and diligence have inspired some amazing reviews online. In fact, it was extremely difficult to choose which to include. “Dr. Chang is the most compassionate, caring, intelligent, patient and thorough doctor I've ever met. It's extremely difficult to find someone this good, who at the same time cares SO much about you as an individual, in any field, let alone in fertility medicine. Having met with 3 highly rated fertility doctors without feeling any level of comfort, we were on the verge of giving up on IVF. We didn't want to go forward with a long, difficult, exhausting and expensive process unless we felt we were in the right hands. Luckily, that's when a friend recommended Dr. Chang, and I cannot be more thankful. Dr. Chang wasn't just perfect on paper; she was exceptional in person, a very hard find these days. My husband and I both knew right away that she was a perfect fit for us, not only as a human being, but as a physician, and not just as a fertility doctor, but as an overall informed, Western medicine doctor with a holistic view of the human body. Dr. Chang wanted to diagnose my potential problem right away, and before we even started to ever speak of IVF, we went through a 3-month diagnostic period with many outside referrals (she has a network of excellent physicians and fits you in with them immediately), and much bloodwork to figure out why I was struggling at a rather young age. In the meantime, she watched, learned, and managed my lifestyle closely, eliminating all potential risk factors that could be a threat to this baby making process. These glowing words of praise and gratitude are humbling, but they are a testament to how Dr. Chang makes her patients feel through the entire process of infertility testing and treatment. Infertility can be isolating and overwhelming. Knowing that you have a doctor on your team who is fully invested in your success and who truly cares about your experience can be an immense comfort at a very difficult time of your life. 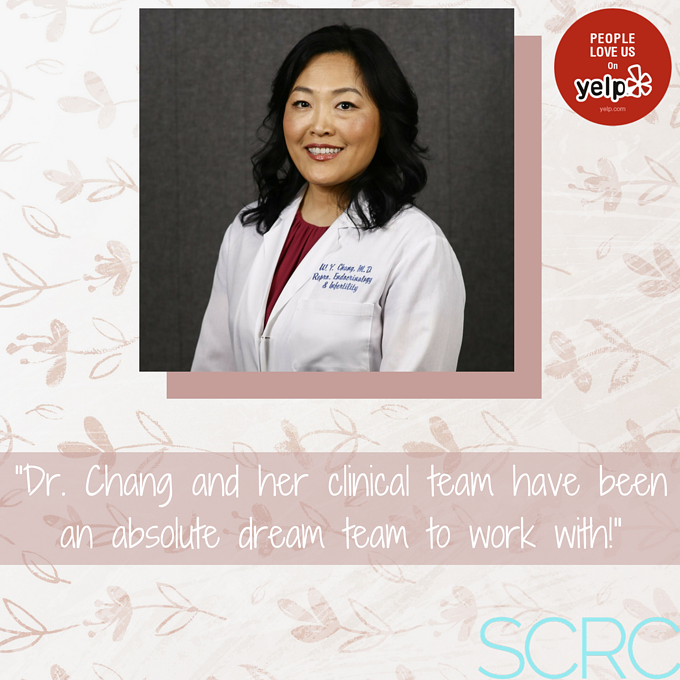 Dr. Chang is that kind of physician, and we are proud to have her as our partner and colleague at SCRC.